While the world was opening up pre-orders for the Galaxy S6, S6 Edge, and HTC One M9 on March 27, Verizon held back because they are a “leader, not a follower.” Thankfully, today is April 1, the super serious, perfect day to do anything on the internet. Yep, Verizon pre-orders are now live for the three Android flagships that will dominate headlines for the foreseeable future. The Galaxy S6 comes in black, gold, or white, and starts at $24.99 per month on Edge, $199 with a 2-year contract, or $599 at full retail. 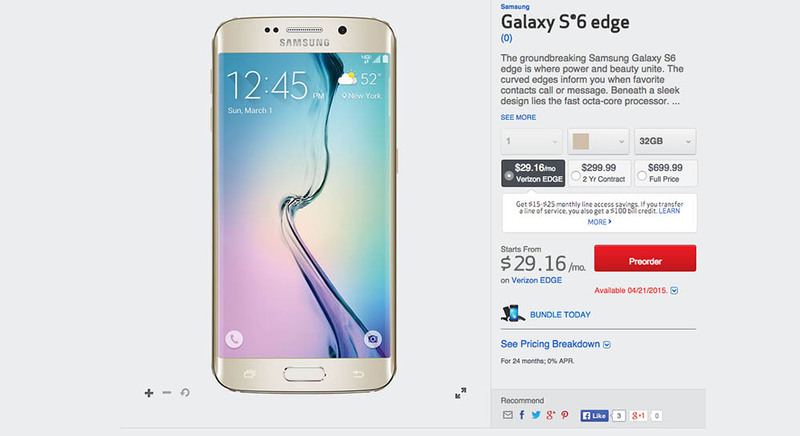 The Galaxy S6 Edge comes in the same colors, but starts slightly higher at $29.16 per month on Edge, $299 with a 2-year contract, or $699 at full retail. The HTC One M9 is the same price as the Galaxy S6 and comes in either silver or gunmetal grey.